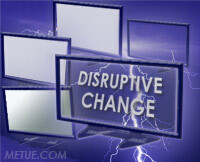 Contemplating Disruption: Will Internet Evolution Hurt Big Media? Looking back through centuries of history only a short list of communication technologies have fundamentally changed the way people and societies share information; things like written language, the printing press, the telegraph, the radio, and television. Each, over years of evolution, utterly disrupted existing practices, pushing aside the antiquated and expanding the depth of possibilities. Each, in developmental years, had critics predicting there’d be little long term value. Each also has had champions who eagerly predicted the innovations would drastically reshape the world. The Internet falls in to the same exclusive club but its functionality and contribution are still evolving. It will take decades before the breadth of its impact and transformative power are fully understood. Still, that won’t stop many from predicting where things will go or how the Internet will continue to shape our world along the way. Monday, Lehman Brothers took a stab at such a prediction. Citing the disruptive power of the Internet, and its likelihood of changing business economics in the entertainment industry, they downgraded stock ratings on several companies. The recent history of the music industry was cited as one partial justification. The view seemed extreme. This METUE review takes an in-depth closer look. The internet is awash with examples of futuristic predictions that came up short (and plenty that came true too). There are top ten lists, wiki’s, quote archives and countless other repositories. Leading the charge, back in 1876, President Rutherford B. Hayes saw the telephone for the first time. In reaction, he said to Alexander Graham Bell “That’s an amazing invention, but who would ever want to use one of them?” During the same year, a Western Union Internal Memo predicted similarly that “The ‘telephone’ has too many shortcomings to be seriously considered a means of communication.” How wrong they both were. Not even experienced technologists are immune. In a famous recent example, one from a technologist who’d presumably know better, Ken Olsen, then President, Chairman and Founder of DEC, famously said in 1977: “There is no reason for any individuals to have a computer in their home.” He was right – there wasn’t much of a reason given the state of in the industry at the time but fast forward a few years, or a decade or two, and how different the story became. Optimists championing technology have fallen into similar traps at the opposite pole of opinion. In one example, in an 1858 book called "The Story of the Telegraph" authors Charles F. Briggs and Augustus Maverick wrote:"Of all the marvelous achievements of modern science the electric telegraph is transcendentally the greatest and most serviceable to mankind … [it] binds together by a vital cord all the nations of the earth. It is impossible that old prejudices and hostilities should longer exist.." Impossible? Not at all. The reality of futurism or any kind of technology prediction is they’re often going to be wrong, either too conservative or too optimistic. LEHMAN’S CONSERVATISM: Media Today in the Crosshairs of Change? On Monday, Lehman Brothers downgraded their stock ratings for several top entertainment companies. Disney, CBS, News Corp and Time Warner were all cut back. (Viacom was spared but Lehman cut their price target.) At issue are questions about how Internet distribution of TV and Film content might impact traditional revenue models, how TV/PC convergence could alter the landscape. Analyst Anthony DiClemente explained the decisions in his research notes saying, "our fear is that the damage that digital distribution inflicted on the music industry will replicate itself in the movie industry, and our fears are too great to justify keeping neutral or positive ratings on the creators and distributors of movie and TV content." He added: "In reality, while there are many obvious differences between music/audio and movie/video media forms, the core properties of video distribution and consumption are not different enough from music content to continue to justify why movie/TV content will be spared fragmentation… We believe fragmentation of media as a result of technological change is highly likely to disrupt the economics of traditional forms of movie and TV distribution … Content may no longer be king in the entertainment business." LEHMAN BROTHERS VIEW: REASONABLE OR TOO CAUTIOUS? Lehman’s downgrades seem to take a conservative view of these businesses and an optimistic view on how impactful the Internet will be. Is that reasonable? The short answer is maybe, maybe not. It depends in part on an investor’s time horizon and whether they looking for short term gains, or long? Whether there vision is forward one year, three, or five or ten? It depends on whether they’re willing to gamble increased R&D expenses will yield revenue results before traditional revenue models withdraw. One example cited in the Lehman report was DVD sales, notably decreased revenue associated with digital sales as compared to disc. Issues like the impact of digital distribution on DVD sales have been widely debated before. As a matter of fact, it is true that higher priced physical products (DVD sets) generate higher revenue per sale than their digital counterparts. Migration to digital sales could, therefore, drag revenue down unless sales volume is high enough to compensate for the difference. But there’s more to the story. Countering the diminished revenue argument, digital sales are generally associated with lower costs (there is no product manufacturing, packaging, inventory warehousing, etc). Consequently, lower gross revenue won’t automatically translate to decreased profit. This bears out in industry data. Warner CEO Jeff Bewkes explained that during the experimentation phase leading up to the decision, sell through was up on DVD’s slightly (e.g. no cannibalization was caused by digital downloads, for now). More importantly, however, margins were up dramatically. Video on Demand (VOD) “day and date” sales, he said, ran at margins of 60 to 70 percent. DVD sales compared at only 20 to 30 percent. “It’s about a three to one trade.” he noted. That being true, it would appear combined “day and date” advantages could push the on-demand business to become an increasingly large part of the industry’s future revenue stream. It could even appear that digital delivery represents more opportunity than risk. Research from UK service Screen Digest released in March further supports that idea. Their report claimed the sector might generate only $33m in incremental revenue this year through the US and major European markets but by 2012, it stands to be worth as much as $1.1billion in total consumer spending. The facts seem to be: Internet On-Demand services are efficient, they have higher margins, and they offer greater consumer flexibility. For the content producers/media companies, “Day and Date” releases bring a few added cost savings too. For one, they stretch marketing budgets across a wider time period (there’s no gap between releases and therefore less need rebuild buzz). The shortened release windows also remove one of piracy’s stronger incentives, time. (If a movie isn’t legally available for months, an “I want it now” type of consumer has incentive to get it illegally. If the windows shrink and there is a legal option, that incentive is less relevant). Will volume growth of digital sales be fast enough to replace lost revenue from a dvd withdrawal? Will marketing and other cost savings further improve earnings? Analysts can model the data and are prone to draw their own conclusions at what outcome is most probable. Differences are to be expected. That Internet delivery of video and TV content will eventually become a mainstream standard is a given. The question is one of when, not if. Will TV/PC convergence devices like Apple TV, Netflix ROKU box, the Xbox 360 or Sony’s plans for the PS3, accelerate the pace? Does their existence imply we are entering an accelerated phase of that evolution? Or is the bridge between the TV and the PC not yet built? Analysis like that put forth by Lehman Brothers attempts to make (or infer) a prediction on when this will happen. Nobody knows the real timeline. It’s reading tea-leaves. By some accounts, it’s a few years off. Maybe near 5 years. Others think it could be sooner. Other’s still, even further away. Back in 2005, MGM published a number of slides on their website that gave insights in to the finances of the movie industry. One image showed it took five years for 30 million DVD players to be sold, comparatively it took nearly 8 years for CD players to reach similar milestones. It took 10 years for PCs to reach that volume. That begs a question: If Internet distribution of video to the living room (PC to TV Convergence) is the obstacle to rapid adoption of digital delivery, and if consumer hardware is necessary to build that bridge (TV, Set Top Box, Game Consoles etc), how long will it take those electronics to gain widespread adoption? Though the Lehman report characterizes consumer consumption of video and music as similar, there are, significant differences not the least of which is consumer usage habits. Simply put, Music, dating back to portable radios and walkman’s is something people carry with them and listen to on the go. Whether at the gym, in the car, on the train, or at the office, people are habitually comfortable with music on the move. From cassette tapes to CD’s and then into the digital era, this is a behavior we’ve grown accustomed to. Our history and habit of engaging video entertainment is different. Even accepting the widespread acceptance of portable short form (micro-chunk) content on cell phone and other devices, feature length video is something we more often consume in a fixed setting: the living room, the backdrop at a bar, the movie theater etc. Improvements in device memory and devices (like the iPhone) make it easier to transport the content or watch it "on the go" and display technologies and other advances, products like Microvisions Pico Projector, are poised to drive that further, but the habitual base of our consumption is still different and will likely take more time to change. While any form of digital content carries with it risks of piracy and theft to the content owner, there’s a difference between music and movies tied to traditional delivery mechanisms and these differences are likely to effect usage patterns. Music: in CD form, music carried with it no digital encrpytion. You could play or copy your discs without impediment (legality) not withstanding. When the industry shifted toward digital delivery, however, they attempted to correct this with restrictive Digital Rights Managment technology. It was like trying to repackage a can of worms. The DRM systems and the lack of an open standard, coupled with the existence of massive amounts of DRM-Free music in the public domain (CD’s), helped build a giant underground file sharing community. This paradox of DRM helped dig the music industry into a big hole. Instead of proactively supporting consumer needs and serving the customer, they fought them. Movies: DVDs and VHS tapes come from a different history. Even though, like music, movies carry a risk of piracy, packaged as consumer products, they have long been encrpyted with copyright protections. Its both illegal (as with music) and also relatively difficult to bypass these systems. Another major difference goes to the operations and holdings of the businesses being compared. Businesses like Viacom, CBS and News Corp aren’t bystanders sitting idle as their businesses are overtaken by new competition. Just the opposite, and arguable in contrast to how the music labels handled some of the earliest digital developments, the movie and TV companies are actively participating, even driving, part of the Internet evolution. Consider CBS – once the purest play of TV networks, they now hold a developing movie studio, have a radio market that is expanding in to the digital arena (via purchase of Last.fm), and a broader media platform that’s been newly supplemented with the purchase of CNET. News Corp is a similar, and even more diversified, property. Globally, they hold major brands in TV (Fox), Film, Internet (MySpace), and Print (Wall Street Journal). Viacom and Disney fit the bill too. They have gaming interests, TV networks, film and TV production and vast internet properties that can be harnessed for distribution and audience. The companies are also active investors in developing technology. (Disney has an affiliated venture fund (Steamboat) and stakes in several related technology companies). Across the pond, similar is true at BBC Worldwide too. The company that is the wholly owned commercial subsidiary of the British Broadcasting Corporation owns, or has sizable investments in, television, film, magazine publishing (3rd largest in the UK), and digital media. Tuesday the BBC released fiscal year results that, while attached to cautious guidance, showcased the benefits of the same kind of diversity. •The online business grew from 1.1% of revenues in 2006/07to 2.7% in 2007/08. • Sales outside the UK represented 49% of gross. •Overall sales, including the BBC Worldwide Group of companies’ (the Group) share of the sales of joint ventures, grew 13.1% to £916.3m (2006/07 £810.4m). Excluding the impact of the Lonely Planet acquisition in October 2007, sales grew by 10.2% to £893.2m compared with the previous year (2006/07 £810.4m). •Operating profit has grown 17.0% to a record £117.7m (2006/07 £100.6m before net exceptional profit of £10.5m). In the current year there were no exceptional items. Profit after prior-year exceptional items grew 5.9% over the same period (2006/07 £111.1m). Using the BBC as a global example, or looking back at comments made by Rupert Murdoch, or CBS’s most recent earnings release, it’s difficult to agree with Lehman Brothers caution. Earlier this week I read a blog post written by billionaire techy turned blogger, Mark Cuban. He titled his essay “The Internet Hammer and the everything Nail.” In it, Mark mused on the old saying “"When You Have a Hammer, Everything Looks Like a Nail,” how, to some the Internet is both cure all and destructive force. I couldn’t help but think that for analysts evaluating the entertainment industry, the Internet seems to sometimes look like that hammer. There seems to be a tendency to look at its impact, and assume, with brute force, it will beat on all nails. In my view, that’s the issue with Lehman’s analysis. It puts too much weight on indirectly related past events (music industry) and deeply discounts an established industry’s ability to learn from that and evolve without making the same mistakes. The Lehman guidance is conservative and appears, extremely cautious. But then, when leaning toward the future, experts and analysts are often wrong. There’s no exact science. In 1981 Bill Gates, famously said, “640K ought to be enough for anybody” when referring to computer hard disk memory capacity. Today that wouldn’t be enough for a cell phone. So, an expert like Bill Gates was way off and an entertainer known for his quips was right? Predictions aren’t easy. I have lived through several periods of development in the fields of communication and entertainment. I remember the day when wireless as a service of transoceanic communication was regarded by some as a joke. Those who owned cables could not see wireless as a competitor of cables. Who would entrust important messages to a medium that was filled with static? I lived through the day when the Victor Talking Machine Company could not understand how people would sit at home and listen to music that someone else decided they should hear. And so they felt that the ‘radio music box’ and radio broadcasting were a toy and would be a fancy. I saw the same thing happen in the field of talking motion pictures. It was urged by many that people would not go to a movie that made a lot of noise and bellowed through an amplifier and disturbed the slumber of those who enjoyed the silent movie … and then—in 1927—came Warner Brothers with ‘The Jazz Singer’ and Al Jolson. Almost overnight a new industry was born. Today, who goes to a silent movie? Let me assure you, my friends, after more than forty years of experience in this field of communications and entertainment, I have never seen any protection in merely standing still. There is no protection except through progress. Therefore, may I leave you with this final thought: I would suggest that you reflect carefully and thoughtfully upon the possible ultimate effects of television upon your established business if you do nothing, and of the great opportunities for your present and future businesses if you do the right thing! If Television is replaced by Internet in Sarnoff’s essay, the message seems as poignant as ever.